Something new from Writer’s Digest Books. Sometimes I’m asked why I teach writing. Here’s my answer. I teach because I know what it feels like to be an unpublished writer wondering if he has the stuff. For about ten years after college I was of the belief that writing fiction could not be taught. I’d been told that writers are born, not made. I was warned not to waste money on craft books. I began with screenwriting. The seminal book was Syd Field’s Screenplay. He broke down the three-act structure, and I spent a year watching movies, timing them, figuring out what happens at various points, and why. Field, however, had a notion about the first “plot point” that was not entirely clear to me. He said it “spins the action” into a different direction. I felt there had to be something more to it than that. So I intensified my study on that structural point. And one day it hit me. What has to happen here is some event that forces the Lead into the confrontation of Act II, and is vitally connected to the main conflict of the story. It is also a place from which the Lead cannot retreat. It was like going through a doorway of no return. I tested this against classic movies, and lo and behold, there it was. I got so excited about this I began to share the Doorway of No Return theory with other writers. They’d stroke their chins and think about it and then say, “Yeah. I see that.” And when they saw, it made me all the more jazzed. So I kept studying, trying things, creating techniques for myself. When something worked, I journaled about it. I was like Dr. Jekyll keeping track of all the experiments on himself. Only instead of turning into Mr. Hyde I was becoming a writer of saleable prose. After landing a five-book contract I began to teach at conferences, and started writing articles for Writer’s Digest. Later, I was the WD fiction columnist. And all the time I had this in mind: I wanted people to know it CAN be done. You CAN learn the craft. You CAN get better. The naysayers are touting a Big Lie! Don’t believe it! And I’d hear from folks that they were learning and growing and getting agents and contracts and hitting bestseller lists. The Big Lie was dead! So keep writing, friends. Keep learning. Those are parallel tracks. 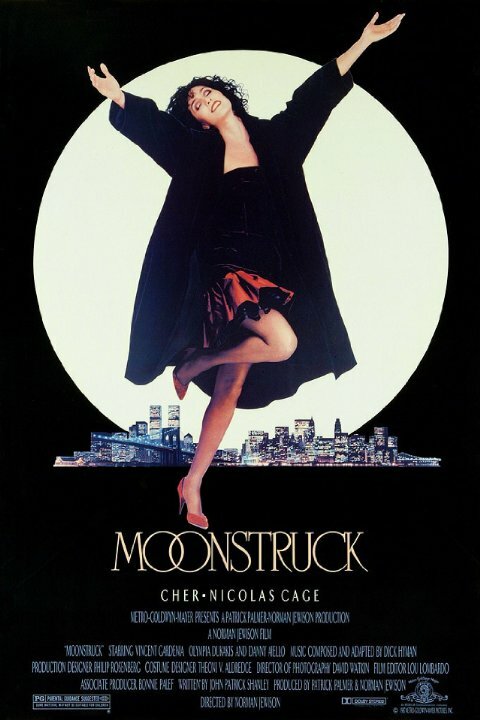 I keep on both of them myself and have ever since that day I walked into the sunlight after seeing Moonstruck. I still get pumped about trying things and figuring out what works, what makes my own fiction better. And I still love to share what I learn with fellow writers, as do all my blogmates here at TKZ. That’s why I teach writing. 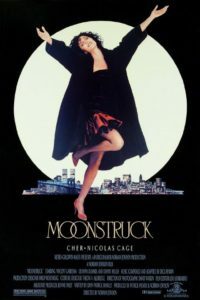 This entry was posted in Moonstruck, Writer's Digest, Writer's Digest Books, Writing by James Scott Bell. Bookmark the permalink. And we thank you for all the time you’ve put into sharing your knowledge with the rest of us. I’ve had many of those “aha” moments while reading craft books by you and many others who’ve learned the hard way. Thanks for all that yo do, Jim. You’re welcome, Ron. We at TKZ appreciate your contributions. I second that motion. Thank you! I suppose it’s possible that becoming a Pulitzer Prize-winning author may not be teachable, but learning to write professionally and to create great stories that people want to read is definitely within the reach of most of us if we take the craft seriously and if we practise, practise, practise. Did you mention that teaching can be part of our own learning process? That it forces us to explain things in different ways so that our ‘students’ can understand it, and by doing so, we internalize more of the craft for ourselves? Sheryl, you’re absolutely right. 16 or 17 yeas ago I signed up to teach an 8-week course on suspense writing at an adult learning center here in L.A. It forced me to think it all through and nail it down, so I could teach it, which in turn made it clearer to me as well. I’m happy to say that one of the students in that first class has gone on to write critically acclaimed thrillers. I third that motion. Thank you, Jim! Your passion shines through, your enthusiasm infectious. Sue, we at TKZ appreciate your positive vibe. That also shines through! Jim, when I’m asked by a fledgling writer what book to buy, I always start with your WD Digest book on plot and structure. The LOCK system is a great place to begin. Thanks for sharing. Actually, you first met me at the workshop at Glorieta, where you and Al Gansky said, “You ought to try your hand at fiction.” Ah, you knew not what you set into motion. But thanks. Ah, that’s right, Doc. You were about 23. Now I remember! Not published ~ yet (the operative – and optimistic – word there) but your posts (as well as the rest of the regulars and “repliers”) give unknown encouragement and instruction~ both in your instructional and “recreational” writing. And ain’t findin’ somethin’ you love doin’ THE way to make a life out of makin’ a livin’? Not everyone has a job they love, of course. So carving out time for their writing, and writing with joy, is a boon. I fourth the motion. Thank you for your teaching, Jim! Your craft books were the first I read and studied. Your basic premise that we can learn is what keeps me going in writing. I attribute your theories and principles (the mirror moment, the golden triangle, etc) with the success of my stories. And your advice to stay on the parallel tracks of learning and writing keeps me reading two backs at a time – craft and fiction. I see you as the vanguard, the scout, the leader – shining the light of the truth on writing and dispelling the darkness of the big lie. Now that sounded a little too religious, but, hey, it’s Sunday morning. Thanks for all your many teaching moments! I see the next book on craft needs to be proofreading. Proofreading gets us all, Ron. Those of us who need it most need to untie. Thanks for the good words and encouragement. All my mates here at TKZ like to shine the light. We’re glad to hear when it illuminates something for a fellow writer. I am very grateful for yourself and others who teach and inspire us to write. My first dose came in 1st or 2nd grade when I pulled words together in my first sentence. I remember thinking how powerful that was & that I was going to do more of it. Add reading books to the mixture, like The Hardy Boys and then later, being utterly in awe of Zane Grey, who pulled me out of the flat, featureless state of Maryland and into wonderful western settings that captured my imagination. I think I got my start on writing instruction with Syd Field’s “Screenplay.” In 2004 at my first writers conference, Jack Cavanaugh gave a very solid overview of the novel writing process–I still have my hand written notes in my files. At this point, I’ve stored up countless books on craft. Gosh, my actual and cyber-shelves are full of books that have helped me over the years. Many of yours, Writing the Breakout Novel (looking forward to this one day conference in exactly 2 weeks) and others. While I’ve heard some of that nonsense about writing can’t be taught, you’ve either got it or not, for the most part, I’ve been fortunate to be in an environment surrounded by many others who dream of writing books and share with each other on the journey so that we can keep improving what we do. I used to feel guilty about buying craft books–and I do still feel a twinge every now and then. But I know from experience that you just never know when that one little sentence or paragraph from a craft book is going to be the next “aha!” moment to make your writing take a leap forward. It’s worth the investment. And it’s a way to invest in others who believe the same as I do–that you can learn to write great books and there are people out there willing to help you do so. Frankly, that’s so much different than most of life and it is refreshing. I love my shelves of writing books. I like to review them, scanning the highlighted pages. I also have five big binders of WD issues, when Lawrence Block and then Nancy Kress did the fiction column. Underlined, of course. You know, over the almost 30 years I’ve been investing in writing books, I can only thing of two (2) from which I didn’t get at least one nugget (and usually many more) I could use. Pretty good ROI, I’d say. Jack Cavanaugh, BTW, is a dear friend of mine. Before I was published he gave me some great advice that shaped my career. He taught me also to pay it forward. It was in August 2008, when I attended my first writer’s conference at my wife’s gentle urging, that I began walking “the path of craft” on my fiction writing journey, after years wandering in the wilderness of failed stories and novels. Your books on writing craft have been a huge part of that path. I’m taking an online Coursera class, “Learning about learning,” which discusses the “Illusion of Competence:” students, having been exposed to the material, think they’ve mastered it when they haven’t at all. You have to engage with the material, practice it, get feedback, fail and try again, ponder, and practice more. Exactly as you show us in your books. I love your emphasis on breaking things down, practicing, reading novels that work with an eye toward seeing these craft elements in practice, and trying them in our own work. Count me as another of your many students who has benefited enormously from your teachings. Thank you! Dale, thanks for the info about the “illusion of competence.” So well put. The people who succeed (at anything) know that competence requires practice, and mastery even more practice. Nicely put. Jim, I regularly quote from your books to my editing clients, because I see in their work the same recurring problems you cite — throat-clearing openings, action paused for explanation, Happy People In Happy Land, Mary Sue wish-fulfillment characters. And, especially, the unwillingness to lock their characters into the conflict. I say “Act first, explain later” so often that I feel it ought to be your epitaph. Thanks, Jim. I’ve read many craft books and gotten something out of all of them, but yours are the only ones I really connect with, the ones that dispense quickly with theory and abstraction and dig into the stuff that matters most — the sturdiness of the story scaffolding. Thank you kindly, Jim. I really appreciate what you said, because that’s always been my main goal as a teacher. Not to drape everything in academic-sounding and theoretical terms. I want to impart what I’d been looking for myself — nuts and bolts, what actually works, in terms I could understand and apply. As one of the planning committee members for the Breathe Writers Conference I can say that we cannot wait to have you come and teach us in October! Thank you for being so generous with your experience and wisdom! I’m looking forward to seeing you there. Thanks for the invite! Thank you very much for this post, Jim and for your books on the writing craft and on business of writing. Your book on dialogues is one of a kind and haven’t found any better book on dialogues so far. Your book about making a living with one’s writing gave me courage and also helped me identify, which of the available methods to try first. I went the indie way and enjoy it a lot, even if it will take some time until I’ll earn my living with it. Thanks, Victoria. The dialogue book is special to me because that was the one area I couldn’t find much on when I started studying the craft. Mostly people said you have to learn to listen (eavesdrop) and that was about it. I’m happy the book has been a contribution to the subject. Frances, thanks for the support. One of the GREAT lines in the movie, among so many, Joe. And we’re so glad you do teach!! I struggled with learning how to write. Your book, “Plot and Structure,” really made things hit home. Keep up the good work!! I’m still working on it, but getting better every day!! You ARE getting better. You have exactly the right attitude, Traci. Thanks for the good word. Congrats on the new book. When I teach “the first plot point” in my workshops, I always do two things: I credit Syd Field for the term, and then as I fold the principle into the context of the novel, I mention it can and is called other things, including “the doorway of no return,” which is a great companion definition, one that I always credit to you. So when I saw the title of your new book today, I had to gulp. Because I tell my writers that “just write” can be among the worst possible writing advice ever, for those who aren’t aware of the intended context (perseverance) and aren’t enlightened in – and here’s the irony – the very craft mentoring you deliver in the content of the book. Of course, I had no idea you were about to launch a book by this title. It’s still among the worst advice ever, without a deeper understanding of the intended context. To “just write” without an awareness of the finer points of craft, without an intention of studying them, without a means of recognizing that craft in one’s own work and in what we read, is the spinning of one’s wheels. I like to say (because it usually gets a laugh) that this is like telling pre-med students to “just cut”… “just cut, it’ll come to you, keep cutting, you’ll figure it all out.” What we do as novelists is much too complex to leave it as simply “just write.” We need books like this to make the deeper context available and clear. You and I have been writing those books for years. 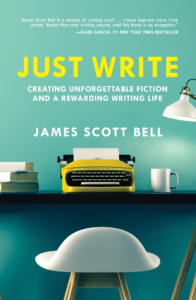 I hope your readers quickly grasp the context, and realize that the enlightenment that compromises the flip side of the advice to “just write” is waiting for them within the covers of the book that bears the same words, and will deliver the clarity they require to make “just write” the good advice it can be. LOL, Larry. I thought you’d get a “gulp” at the title. For I know (and agree with) your assessment of “just write” (lower case) when it is given as cul-de-sac advice. WD chose the title as a play on words (Just Right), which I think is “just fine.” Who knows? Perhaps we’ll convert a few of the “no craft books” people this way! As one of your many admirers and students (TKZ, books, Story Masters) i share the appreciation expressed in these comments. Your wisdom, wit, and kind heart provide education and example on how to become an author and how to behave as one. I’ve benefitted greatly from your instruction. One of many who are thankful you teach. Thank You. Tom, that is nice of you to say. I am in this to help, and it always heartening to hear I’ve been able to. Keep writing, pal.